Yoga is increasingly popular in the West as a way of relaxing, improving health and relieving medical problems. For those not in the know, the application of yoga is to maintain a firm but comfortable position (asana), develop your breathing (pranayama), relaxing your body and gaining deeper self-awareness. Yoga also serves as a good workout as you maintain poses over many minutes. So why practice yoga on a paddle board? 1) Better workout – You need to engage your core muscles more to maintain your balance on the unsteady surface. You will also find your technique improving as your left and right side work evenly, your dominant half will have to ease back. 2) It’s more relaxing – Being disconnected from the ground, floating helps disentangle your mind from the worries of the world and makes it easier for you to achieve a peaceful state. 3) Aids breathing concentration – The regular bobbing of the water and the sound of it lapping against the rails gives you a natural rhythm that helps synchronize your breathing and aid pranayama. 4) Focusing on now – The risk of falling in the water gives you a safe kind of fear, a frisson of excitement, which helps keep your focus. This is something you can’t feel when you’re practicing on your mat in your home or gym. 5) It’s just you – You are at one with Nature and that kind of connectedness is what yoga is all about; the word ‘yoga’ is often translated as union. Unpacking the budget Breeze was a pleasant surprise – the accessories came out fully branded followed by an attractive white and green roll of inflatable stand up paddleboard. We inflated it with the bundled pump in just over five minutes getting a decent workout in the process. The design is of the ‘All-Around’ type – the rounded oval shape makes for a stable platform. And just because this is a cheaper board it doesn’t mean that Aqua Marina has scrimped on the materials – the construction is of a double-wall drop-stitch PVC which is robust and seems unlikely to suffer damage under most circumstances. We would prefer a rail height over four inches to improve stability further but, if correctly inflated, it should be rigid enough to give confidence. The package includes two small fins and a large detachable center fin that all contribute to keeping the SUP’s travel straight and true. The deck’s track pad is seriously big, taking up 80% of the board’s area and is finished in a durable, honeycomb-groove EVA design which provides good grip and comfort. This is ideal as your waterborne yoga mat! 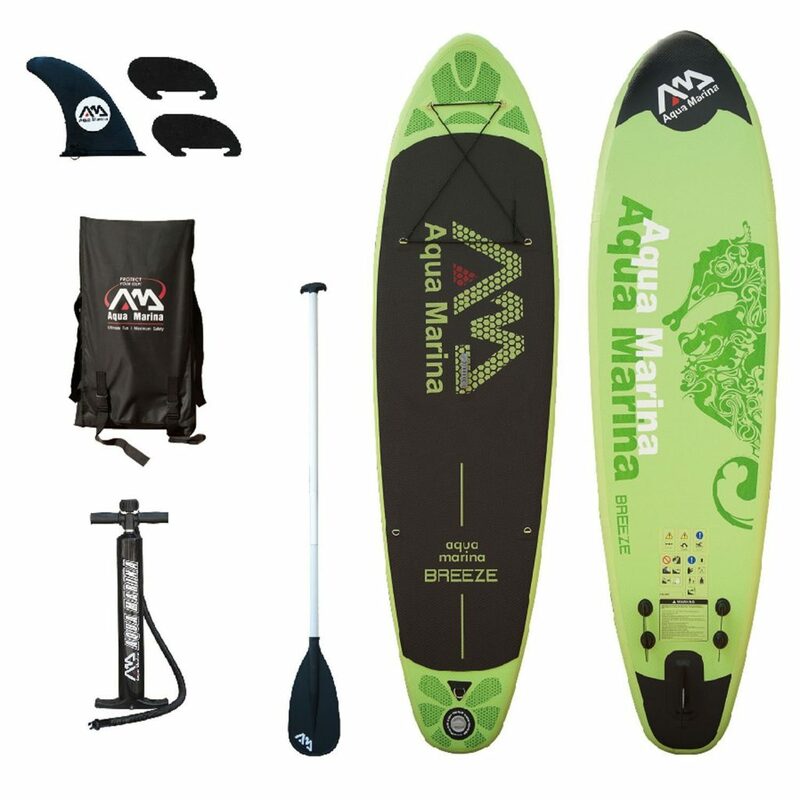 The board features a D-ring for a safety ankle leash (although, sadly, one is not supplied), a two-piece adjustable aluminum paddle and a magic backpack that holds the whole kit. The paddle floats if accidentally dropped overboard and the backpack has good internal compartments and comfortable straps so as not to dig into your shoulders when on the move. On the water our lighter reviewer – and keen yoga practitioner – found the Breeze a good performer and quite stable thanks to its ‘All-Around’ design and generous width. However, our more amply-built reviewers experienced a bit of bowing and, although they loved the large track pad, they commented they would prefer a longer board to feel more secure. We think this is an idea beginner board for those who want to take their yoga to the next level or want to take the first step into paddleboarding with a view to then practicing yoga. Editor’s Choice The Breeze gets an Editor’s Choice for being a great floating yoga board with its huge track pad area at a low price. The Zray board is stunning in its yellow livery and artistic black detailing. This SUP is also a shade under 10 feet long and weighs a mere 24.5 lbs – ideal for easy storage and transport. Once inflated the Zray is the same width as the Aqua Marina Breeze but a further two inches higher. The ‘super ridge’ six inch thickness gives the board that extra bit of rigidity and ride height that lends itself well to improving your concentration on your yoga. The Zray is made of premium double layers of military-grade PVC that is resistant to UV, dings and scuffs that a more fragile SUP would fall foul of. We inflated our test model and threw it from the roof of our SUV and were pleasantly reassured that the manufacturer’s claims of it receiving no damage were justified! The bundled accessories include a kayak seat, pump, three-piece adjustable aluminum paddle, detachable fin, backpack and a waterproof case. We liked the paddle with its range from 65” to 85” and its internal tube design rendering it unsinkable. We managed to inflate the board in seven minutes, slightly longer than the Breeze but the Zray has a larger internal volume. So what is it like to practice yoga on? The track pad is about half the area of the deck which makes it smaller than that of the Breeze. It comprises an ocean wave EVA design that is comfortable and provides good traction. All of our reviewers enjoyed the extra support from the extra height and the extra rated 55 lbs of load bearing. On our favorite lake on a still day we found it easy to practice asanas and the time flew by. We would say it suits low to mid-weight paddleboarders best. 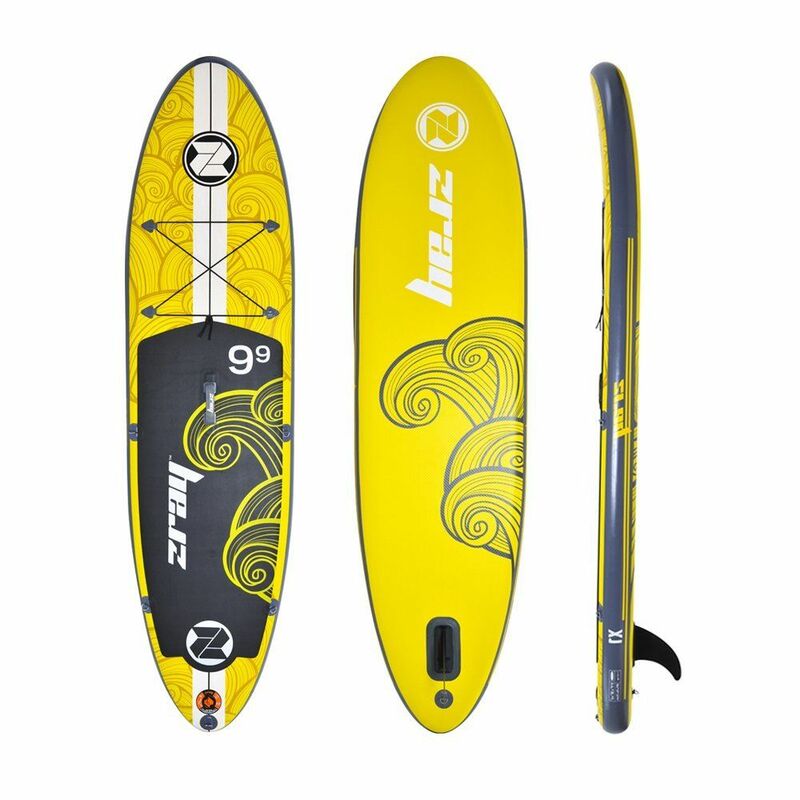 For 13 years ISLE has made professional standup paddleboards and the pedigree shows with their Airtech iSUP. This is the first 10’ 4” on test and the lightest – at just 18.2 lbs. The body is made from resilient military-grade PVC and, once inflated, will support riders up to 255 lbs. Another first for the Airtech is that ISLE offer a risk-free 30-day money-back guarantee if you’re not happy with their board – we wish other manufacturers would have this as standard. 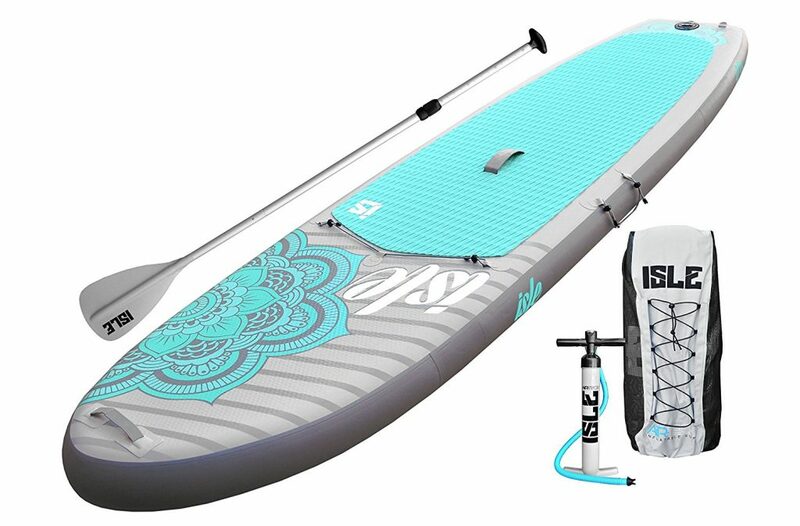 The iSUP bundle includes a branded and color-coordinated high-pressure pump and backpack, three-piece adjustable paddle, detachable third fin, repair kit and backpack. It took us around eight minutes to inflate the Airtech. We love the turquoise and gray pattern retro-flower design and the little touches on the deck such as the yoga strap mounting areas. The Airtech also has a decent-sized bungee area for your on-board necessities. The Airtech was a delight on the water, its wide footprint and straight-cut tail giving superb stability. It’s advertised as being made for yoga and we can’t argue with that. Our reviewers were impressed with the stability of the platform and were able to perform a wide range of asanas and practice some new moves with ease. Even with a bit of chop the Airtech did its job perfectly, not even a drop of water hit the deck. As with most inflatable boards the pressure gauge on the supplied pump takes a little while to register but once you pass the 7 psi level the gauge shows your progress up to 15 psi without worry. With all these positives we were at a bit of a loss to think of anything negative to say. However there is one and it’s fairly important – our paddle wouldn’t stay afloat! So if you decide this is the board for you, make sure you replace the paddle with one that floats. The Lotus YSUP nails it colors to the mast with its Yoga-inspired name-checking. The Lotus is aimed directly at the Yoga enthusiast – rounded nose and squared off tail combining with an impressive six-inch height and generous 32” width to present an ideal floating platform. We love its over-sized foam track pad which easily occupies over 80% of the deck area and proves to be an excellent yoga mat. The outer skin is double-layered thick drop-stitch material and feels very robust and unlikely to suffer damage during regular paddleboarding. It comes with a single action pump which is likely the reason it took us almost ten minutes to inflate. A full 250 strokes are needed to get the job done. On the plus side, the Lotus does feature a removable shoulder carry strap which eliminates the need for a center-carry handle. We would appreciate seeing more boards with the strap instead of the carry handle – it makes the board much more of a yoga mat experience! Doing headstands on it is more comfortable without a handle hole leaving an impression in your scalp. The bundled shoulder bag is attractive and spacious enough to stow the deflated board and pump. The Ride has a great reputation among the yoga community. It’s an ‘All-Around’ design with a whopping 34” width. With a height of nearly five inches it is a practical compromise of the stability of a six-inch board and the maneuverability of a four-inch board. It is an amazingly buoyant beast of a yoga platform and one we really recommend. Red Paddle Co. update their board series each year and the 2017 version has a custom RAM mount (for fixtures like a camera or fishing rod) and a hand held ERS pressure gauge that gives an accurate pressure reading without risk of air loss from the board. The board has three fixed fins preset to the best position for stability. The Titan pump is a double barreled powerful device that enabled us to inflate the Ride in only six minutes – not bad at all for a board with such a huge volume to fill. And did we mention you have to pump it up to 18 psi? 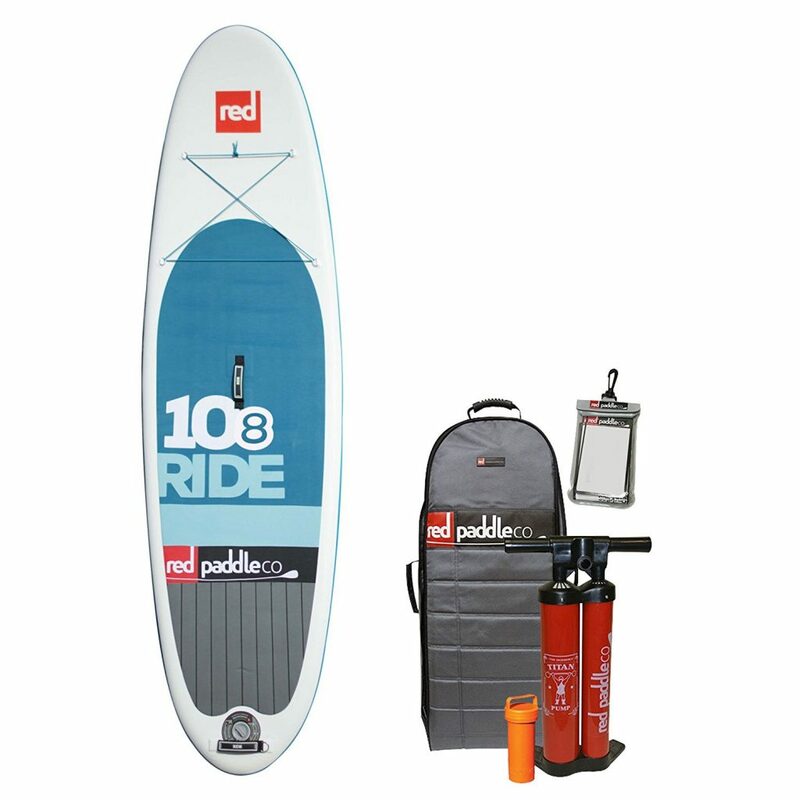 The Red Paddle Co. package includes a stunning carry bag that fits everything in with room to spare and it has wheels! The rest of the package includes a repair kit (in a waterproof floating canister) and a brand sticker. The disappointing omissions are that of a paddle and ankle leash. On the water the Ride outperforms all of its rivals in the – admittedly high – price bracket. Our reviewers could find no fault in this SUP and it was a struggle for them to finish their session. One even had their lunch on the board! On our second test day the weather wasn’t as good, being slightly wet and breezy. That was a bit off-putting to all but our regular yoga practitioner who found the conditions soothing; much to our regular reviewers’ surprise. Editor’s ChoiceA well-deserved Editor’s Choice for the Ride and its top quality stable platform that will help you in your quest for nirvana.